Quality Rating and Improvement Systems exist in most states across the country and are a proven strategy to systematically improve the quality of child care and early learning programs. Early learning programs must be in good standing with all requirements of their regulating authority. 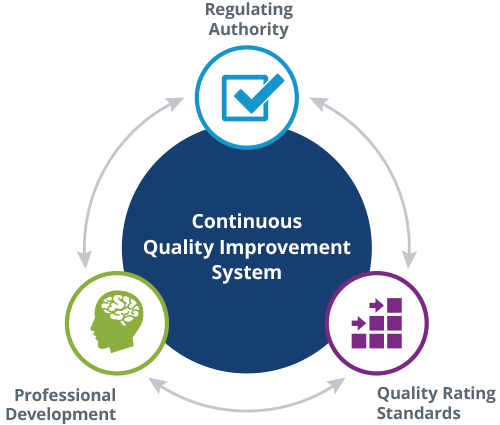 The quality rating standards set the standards for quality improvement. There are five quality levels. At each level, programs are assessed on certain quality features and will be engaged in quality improvement. The criteria define what the program will be assessed on, and the required activities define the quality improvement activities that will be available to help achieve the quality improvement required for moving to the next level. Professional development offers all of the training, learning, and coaching necessary to deliver high-quality services.